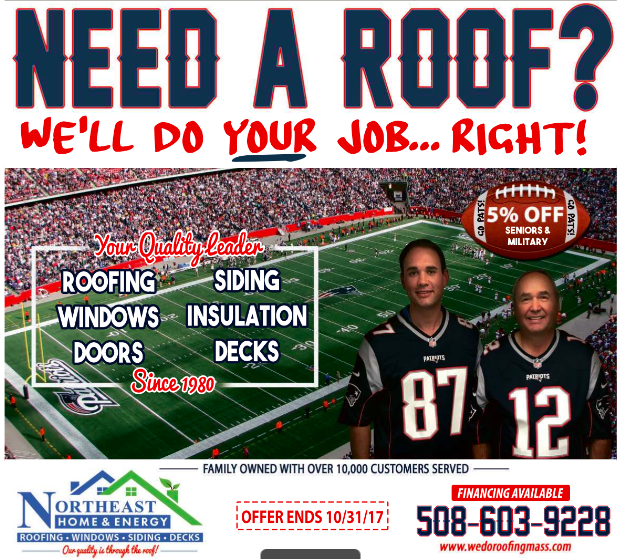 As the hardtsking staff noted earlier this week, the Boston Globe has been running ads from an outfit called Northeast Home & Energy flaunting a nonexistent New England Patriots connection. Yesterday, the Globeniks made patsies of the Pats for a third time. The Roof Bros even have a special welcome on their website for Globe clickers. Apparently the $tately local broadsheet has no problem with paying customers hijacking a local sports team for fun and profit. Rumor has it that the fine folks at WGBH’s Beat the Press will tackle this licensing end run on tonight’s episode. This entry was posted on Friday, August 18th, 2017 at 11:41 am and is filed under Uncategorized. You can follow any responses to this entry through the RSS 2.0 feed. You can leave a response, or trackback from your own site.